Charming 2 bedroom, 2 bath home in the heart of Thornton Park! Impeccable Updating. You will fall in love with this neighborhood with the classic brick street, old oak trees and nearby lakes/parks. 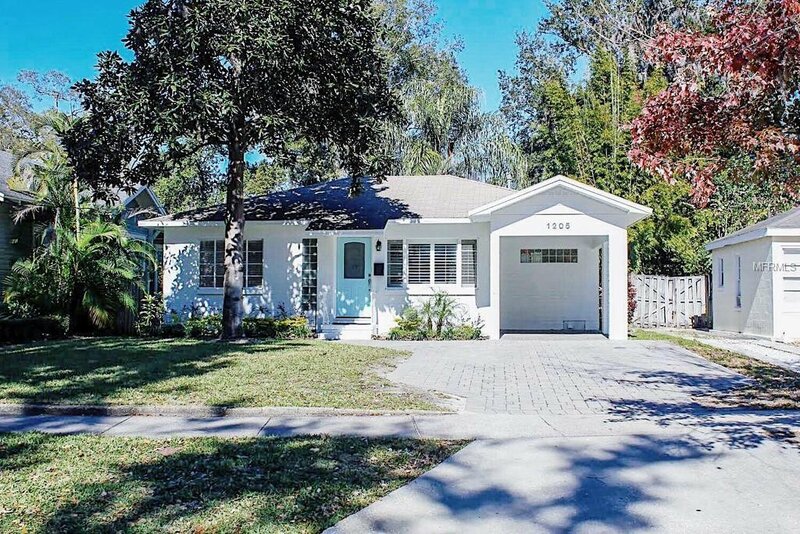 Walking distance to Lake Eola and Thornton Park District shops, restaurants, and entertainment. The house exterior boasts updated landscaping, fresh paint, and a large fenced backyard with a shed. The driveway has been updated with new pavers and fits two cars side by side. Inside, the house features refinished hardwood floors throughout the living room and both spacious bedrooms. The kitchen includes stainless steel appliances, gas stove/oven, wood cabinets, Corian countertops and pantry. French doors lead out to the back patio that is ideal for entertaining. Utility/laundry room is also indoors with stackable washer/dryer and additional storage space. This house is very well maintained and move in ready. You cant beat this location! Listing courtesy of THE SARASOTA GROUP. Selling Office: ORLANDO HUB REAL ESTATE INC.